Despite its abstract appearance, Contrastes de formes, painted by Fernand Léger between 1913 and 1914, is based on a number of traditional pictorial motifs – landscapes, reclining women, everyday objects. While not disappearing altogether, these subjects, treated in close-up, are transformed into simple volumes outlined in black. The principle of contrast Léger formulated in 1913 is here applied systematically. An oval “face” above seems to emerge from a disjointed body, while the colours in their vivacity set up a contrast with the whites. 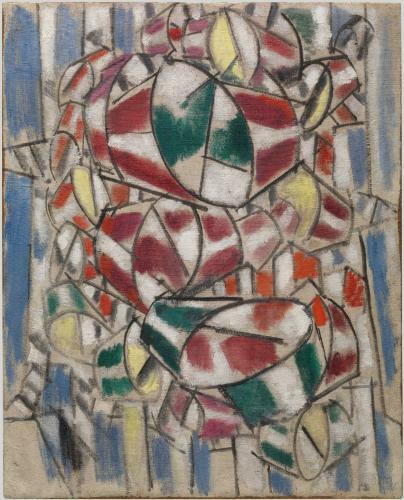 The rough canvas that Léger uses infuses the whole with a rough-and-readiness antithetical to the finesse of Cubist works.